Some piece of news, quoting dpreview.com about the latest (May 7th) Canon release: S5 IS! 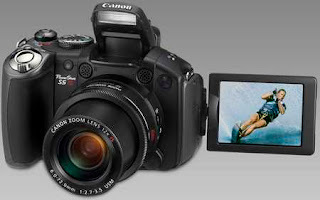 Finally we have the update everyone had expected at PMA, the new PowerShot S5 IS digital camera. The S5 IS features an eight megapixel 1/2.5" (5.8 x 4.3 mm) CCD sensor and a twelve times Image Stabilized zoom lens. Unfortunately this lens, while offering long reach with its maximum 432 mm equiv. FOV doesn't improve at the wide end with the same 36 mm equiv. FOV as the S3 IS. Improvements include Face Detection (for AF, AE and Flash in shooting mode and red-eye removal in playback), a 2.5" LCD monitor (up on the S3 IS) and a flash hot-shoe. Still no RAW support though. As far as RAW support goes, I wouldn't be concerned since there are modified "firmware updates" available even for my A630 that can enable shooting RAW pictures.